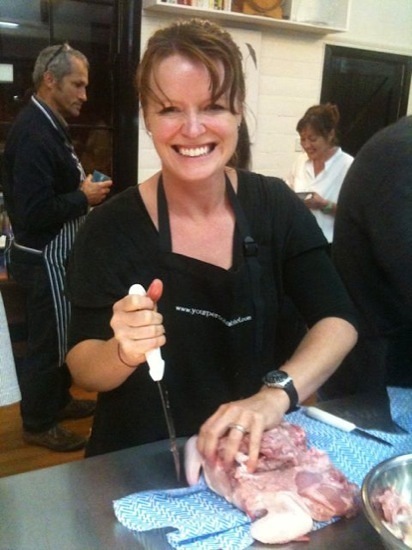 I was fortunate to get to Slow Food Saddleback’s “Small Critters Butchery Workshop” in Gerringong on Friday night. Harrison, the Butcher from Berry (sounds like a Victorian-era villain!) showed us how to bone out rabbits, ducks and chickens. He then demonstrated tying them up in rolled roasts in preparation for a Slow Food lunch on Sunday. It must have taken us close to an hour to bone out the rabbits. Check out how quickly this guy on YouTube does it! The rabbits they had were wild ones, harvested by shooters somewhere up around Kyogle. I had forgotten how small wild rabbits are (I haven’t seen any for a long time!) – these were about 700 g dressed, whereas my rabbits dress out to 2 kg or more. Farmed rabbits are a totally different meat from wild rabbits. If you’re interested in learning more about Slow Food Saddleback, email Kirsten McHugh. @Kate: Your workshop sounds great! Was it a formal, pay-for thing, or was it more of an informal gathering? I spoke to a couple of other people at this workshop that were also interested in learning how to break down a lamb, so I’m hoping we might be able to do that at some stage. A mix of both really. We have a facebook page convening local people who are interested in sustainable living/gardening/chooks. We also meet in real time. The interest was there so we gathered at a local permaculture venue, made a donation, brought morning tea, & shared our knowledge.A couple of folk were pretty knowledgeable, but I think the biggest thing was the support we gave each other to complete what is a pretty challenging thing the first time you do it! 3 of my young roosters were dispatched & they have been yummy! I will definitely do this again. Do you raise your own rabbits? We have heaps of wild ones here but I worry about disease & poison they might be carrying, as I know local farmers put out poison for them. Hi Darren so excited just got tickets to see Hugh in Sydney. Didn’t know if u know about it. He is at Seymour centre 17th June. Tickets 40 each. Hi Darren,what’s going down,other than boning chickens and stuff,not heard from you for ages.Interesting subject you got going here,would be nice to be able to do it.I don’t have rabbits any more and we don’t have too many wild one’s,well,i have one that passes through the garden once in a while.I have added chickens and turkey’s to the garden though,got them at the middle of April.I got dual purpose birds to try,this way we get eggs and we can eat the roosters.They don’t grow all that fast though,may have to get some meat birds to fill in.I bought an incubator last week so i can hatch my own eggs,now i can get right into it.I have seen boned turkey and chicken in the stores.Would be nice to be able to do them this way,they would take up less room in the freezer as well.We have 3 freezers on the go already.Cheers Bob. @Bob: Yeah, I’ve not had the time to post regular updates to the blog for a while. I’m hoping to get it going again over the next couple of weeks. I also raise dual-purpose chickens (Australorps), and I agree – they take much, much longer to grow out than the high-performance hybrids used for meat production. Still, gotta do something with all those useless boys, eh?! I break down chickens, ducks and rabbits for the freezer (into drumsticks, thighs, breasts, loins, wings, etc) so they take up less space, and then make stock or ragu from the frames. It’s not often I freeze a whole animal. Hi Darren, this looks like an awesome workshop. ! I would love toto have been there too. I’m very interested in your meat rabbits. @nellymary: Hi! It’s been a while! It was a great workshop, and lots of fun to meet other like-minded people. You’ll have to come visit sometime to check out the bunnies. @Janie: I’ll be eagerly watching your RSS feed for the arrival of bunnies! They really are great to work with, and probably a better backyard meat source than chickens or ducks.